Since writing about Genevieve Larsson the other day, I have received information on her from Steven Rowe and Randal A. Everts. Although I can now fill in some gaps in her biography, she remains something of a mystery. Jennie Christina Larson was born in August 1886 in a log cabin in Wisconsin. She was the daughter of Swedish immigrants who lived on a small farm with their large brood of nine children. The Larsons resided in the towns of Ella, Frankfort, and Durand, Wisconsin, all located in the western part of the state, during Jennie's childhood. At age nineteen and into her early twenties, Jennie taught school in Frankfort. At some point she also taught at Centennial High School in Pueblo, Colorado. According to her niece, Jennie received a scholarship to Columbia University. I don't know when that would have been, but I suspect it was sometime in the late 1910s or early 1920s. (1) Described as "a free spirit who did her own thing," Jennie lived in Greenwich Village, wrote magazine stories, and shared her home with a man who worked for National Geographic magazine. I have a possible identity of the man, which matches the name of another pulp author. It also matches the name of a man who was married to another woman. I guess I'll refrain from engaging in gossip until I know something more. At some point, Jennie Christina Larson gave her name an artistic flourish and became Genevieve Larsson. She is supposed to have known the Danish-American artist Kay Nielsen (1886-1957), illustrator of East of the Sun and West of the Moon (1914) and a designer with the Walt Disney studios in the 1930s and '40s. I don't have a detailed biography of Nielsen, so it isn't clear to me when he and Genevieve Larsson would have crossed paths. Genevieve was also friends with Agnes Tufverson, the woman who disappeared so mysteriously in 1934. Like Kay Nielsen, Genevieve Larsson died in poverty, "a charity case" at Seton Hospital in Riverdale, New York, where she lingered many months with tuberculosis before passing away on April 16, 1942. Her body was sent to Pueblo, Colorado, to the home of her brother, for burial. For many years after her death, Genevieve Larsson's niece (not the same niece to whom I have referred) tried to secure movie rights to her early story, "Witch Mary." An artist, designer, and actress, Marjorie Goss, aka Christine Larsen or Larson, lived a life that echoed that of her aunt. Born on March 15, 1918, in Durand, Wisconsin, Marjorie Goss studied art and design in high school and at the Stout Institute in her home state. In 1942, she moved to Los Angeles and went to work designing costumes for the Western Costume Company. Marjorie worked on the films State Fair (1945), The Dolly Sisters (1945), and Dragonwyck (1946) before setting off for New York to study acting at the American Academy of Dramatic Arts. She supported herself by creating designs for greeting cards and illustrations for children's books. Christine Larsen's show business career appears to have been brief. The Internet Movie Database lists credits from 1948 to 1958. She remained in southern California and in later years designed needlepoint patterns. Her death is something of a mystery, for Christine Larsen died "a tragic death" according to her cousin, on February 13, 1973, in Los Angeles County. A search of the Los Angeles Times reveals nothing except that--according to the announcement of her funeral--she had a daughter who survived her. (1) Jennie Larson's instructor in writing the short story was Blanche Colton Williams (1879-1945). Dr. Williams was on the faculty at Columbia University in 1913-1925. (2) Marjorie Goss' picture--with Troubetzkoy--appeared in the February 17, 1947, issue of Life magazine. 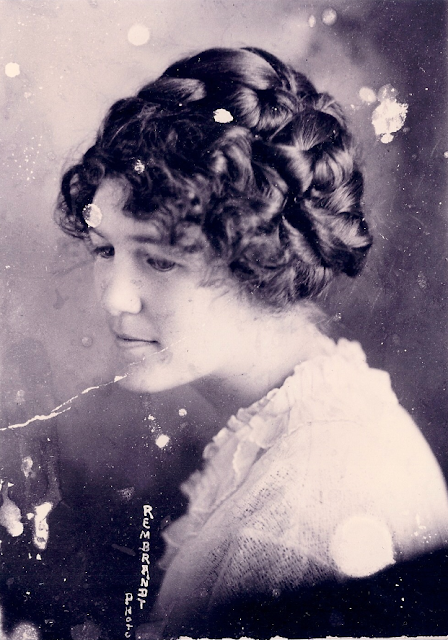 Author Genevieve Larsson, a photograph that may have been taken at a time when she was still known as Jennie Larson. Her niece remembered "how beautiful she was even after such a dreadful disease": Genevieve died from tuberculosis in 1942. Photo courtesy of Randal A. Everts. "She has sparkling facial beauty," a journalist wrote of Genevieve's niece, actress and artist Christine Larsen. "Enormous blue eyes light up deeply dimpled features framed in a wealth of reddish-blond hair. Her smile is almost lyrical." Christine Larsen, born Marjorie Goss, enjoyed a ten-year career in movies and on television. 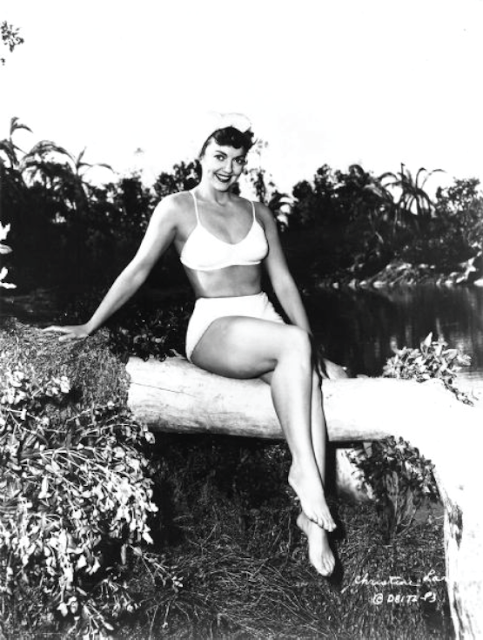 Here's the obligatory swimsuit photo of her, probably from the early 1950s. I wonder if that could be the lagoon from Gilligan's Island behind her. As I write this (January 2012), the members of the World Science Fiction Convention have begun accepting nominations for this year's Hugo Awards. The Hugos have been given out every year since 1955 in various categories: best novel, best novelette, best short story, and so on. You could call them the Oscars of science fiction. To most people, the name "Oscar" refers to the statuette itself, a somewhat abstract figure holding a sword. The name "Hugo" on the other hand refers to a real person, Hugo Gernsback, sometimes called the father of science fiction, or at least, of science fiction magazines. Born in Luxembourg in 1884, Hugo Gernsback immigrated to the United States in 1904 and immediately got down to business making and selling batteries. That business soon went bust, but Gernsback--never one to stay down for long--got into radio, forming the first mail-order firm in that field, the Electro Importing Company. Described by James Gunn as "a mixture of personal reserve and aggressive salesmanship," Gernsback marketed his own Telimco Wireless radio set and other products in a variety of ways, first through a radio catalog, then in the pages of the first magazine in the field, Modern Electrics (1908). In addition to founding Modern Electrics, Gernsback also founded the Wireless Association of America in 1909, published the first book on radio broadcasting in 1910, and predicted the development of radio networks and television. Gernsback estimated that by 1912 (the year of the Titanic disaster) there were 400,000 people involved in amateur radio in the United States. Born in Texas in 1897, Volney G. Mathison lived in Oregon, Alabama, and perhaps California as a child. He taught himself about radio, then called wireless, and acquired a radio operator's license at age sixteen. In about 1918, Mathison went to sea, probably as an operator of a shipboard radio. Based in California, he made jaunts up and down the West Coast, to Oregon, Washington, British Columbia, and probably Alaska aboard tramp steamers. We can imagine a young man with an active and inquisitive mind, manning his radio set aboard ship but with many idle hours in which to occupy himself. Mathison must have known and read Hugo Gernsback's radio magazines. If that's so, he could not have avoided encountering Gernsback's early versions of science fiction. Mathison also grew up in the era of pulp magazines such as The Argosy, The All-Story, The Blue Book Magazine, and Adventure and would have been well acquainted with their brand of fiction. At some point in his seagoing career, Mathison must have decided to give writing fiction a try. Mathison sold several more tales to Sea Stories between 1924 and 1929, including a series featuring the character Zig Jones. I don't know whether Zig is related to Sam, but the latter showed up again in "The Mongolians' Ray," a story for Amazing Stories for that magazine's June 1929 issue. Mathison also wrote for Weird Tales, the first magazine devoted to fantasy fiction, contributing "The Death Bottle" to the March 1925 issue of "The Unique Magazine." Writing under his own name and the pseudonym Dex Volney, Mathison was also published in People's Magazine, Action Stories, Action Novels, Shorts Stories, Street & Smith’s Western Story Magazine, and other pulp titles of the 1920s and '30s. His story "Thor Olsen's Ace" was selected for inclusion in The World's Best Short Stories of 1930. According to Everett Bleiler, Mathison may have been living in New York City and employed with the Pacific Radio Company at the time he contributed stories to Street and Smith (i.e., in about 1932). I have already discussed Volney Mathison's attempts to cast himself in the role of the science-minded skeptic. It would seem that--paradoxically--he was not always a critical thinker and may even have been a little gullible, for he associated himself with the kind of people Samuel Jones, former telegraph operator, was in the business of exposing as fakes. (1) Ralph 124C 41+ ran as a twelve-part serial, meaning, I take it, that the last part was published in March 1912, the month before the Titanic went to the ocean floor. Midway through the run of Gernsback's serial, a young writer from Chicago submitted an unfinished novel to the editor of The All-Story. Referring to the fiction he was then reading in popular magazines, the writer later explained his entry into the field: "If people were paid for writing rot such as I read I could write stories just as rotten. I knew absolutely that I could write stories just as entertaining and probably a lot more so than any I chanced to read in those magazines." The author of those words was Edgar Rice Burroughs, and his finished novel was published in The All-Story beginning in February 1912 as Under the Moons of Mars, later A Princess of Mars, the first in his series of John Carter books. Could Burroughs have been speaking of Ralph 124C 41+ when he described "rot such as I read"? 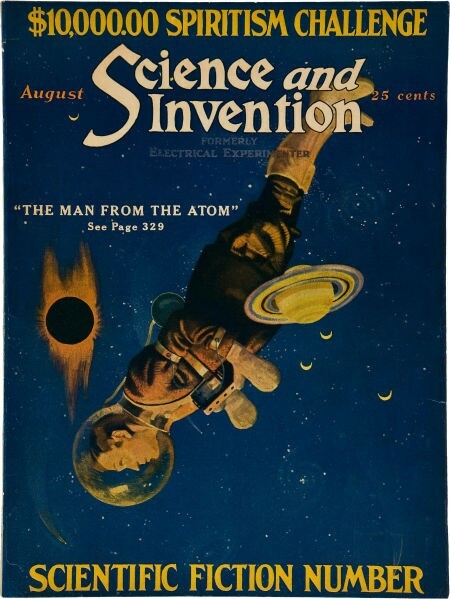 (2) By the time Gernsback's scientific fiction number appeared on the newsstand, Weird Tales had been in print for half a year. Incidentally, Amazing Stories would soon fall into the hands of pulp publisher Bernarr Macfadden (1868-1955). If you want to make a web of connections: Bernarr Macfadden's empire was assumed by Ed Bodin after Macfadden's death. Bodin was L. Ron Hubbard's literary agent and mentor. L. Ron Hubbard and Volney Mathison were associates. 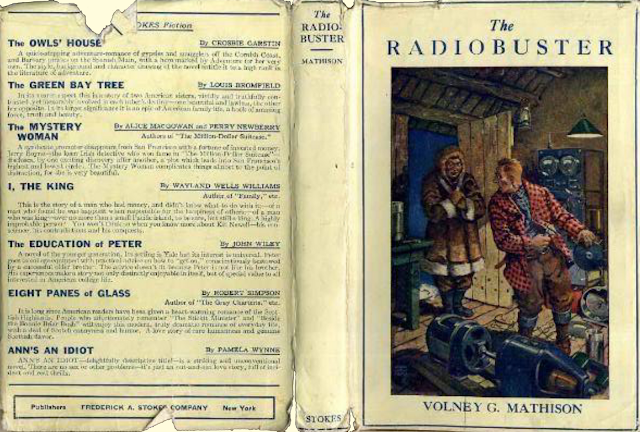 Mathison--like Gernsback--was involved in amateur radio and contributed to Gernsback's Amazing Stories and Radio News. (3) A review in the Harvard Crimson Bookshelf (May 9, 1924) includes a good deal of boasting, which I suspect originated with either the author or his publisher. The publisher, Stokes, characterized Mathison's novel as "the Dere Mabel of radio literature." That term--"radio literature"--suggests that there was a whole genre or sub-genre of fiction devoted to radio back in those pioneering days. Perhaps it's a genre waiting to be uncovered. On the other hand, it may be better left buried. Incidentally, Sam Jones wasn't the first radio operator hero in pulp fiction. George Frank Worts (1892-1962), aka Loring Brent, told a series of tales of Peter Moore in Argosy in 1918-1919. "Peter the Brazen," as he was called, is a shipboard radio operator in the Far East. His adventures were reprinted in The Compleat Adventures of Peter the Brazen in 2003 and Peter the Brazen in 2007. (5) When he described the story, Bleiler may not have known that Mathison was an associate of Hubbard and thus could have missed the Dianetics angle. In any case, I haven't read the story myself and can't offer an opinion on it except to say that it sounds suspiciously like an early Buck Rogers storyline. Postscript: Wikipedia gives "A Phony Phone" as the title of one of Volney Mathison's pieces for Radio News. 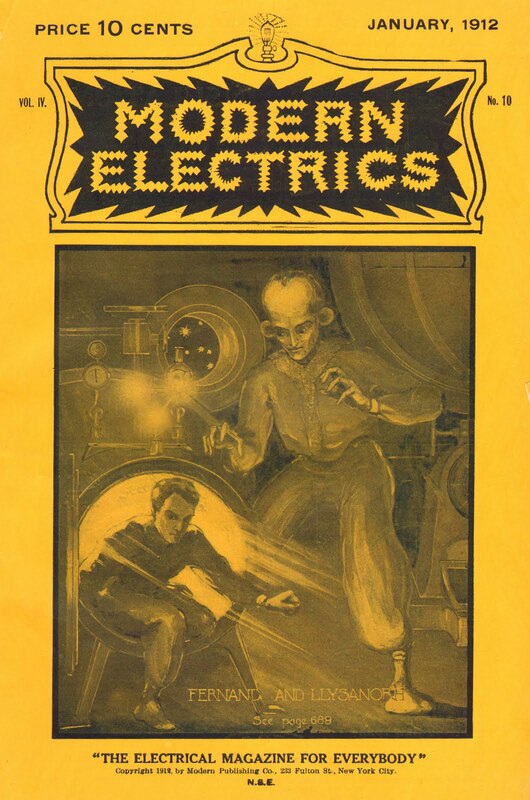 Hugo Gernsback's Modern Electrics for January 1912, featuring the publisher's serialized novel, "Ralph 124C 41+." The being on the right reminds me of James Arness as the Thing from Another World. 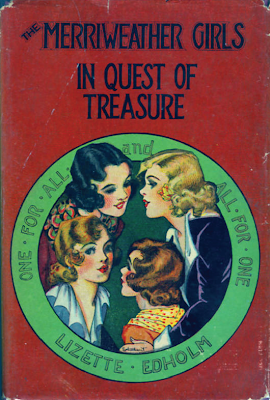 A later reprinting of the novel with a colorful and charming cover by an unknown artist, a cover price indicating this is a British edition, and a cover image showing an early version of Skype. I wonder how much this machine might resemble Volney Mathison's E-meter. Gernsback's Science and Invention, Scientific Fiction Number, August 1923. The spaceman looks a little like Gernsback. Was that intentional? Volney G. Mathison's brass-pounding hero, Sam Jones, made his own trip into space in the 1924 novel The Radiobuster. At the time the novel was published, Mathison was a shipboard radio operator. By the time Sam Jones showed up in Amazing Stories (June 1929), he was a former radio operator, and a debunker for a popular magazine. 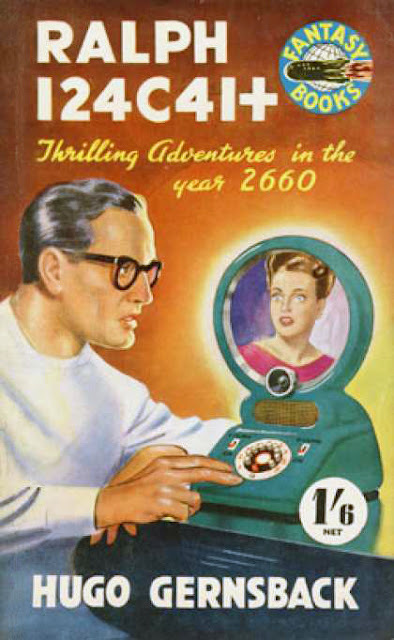 The cover is by Hugo Gernsback's workhorse, Frank R. Paul. 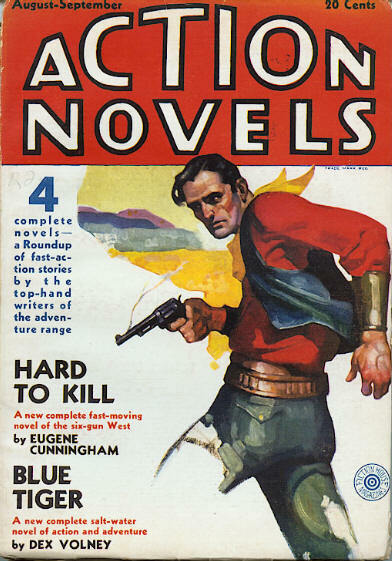 Volney Mathison also wrote under the name Dex Volney, the byline that appears on this cover of Action Novels for August/September 1932. As early as 1918, Volney Mathison went to sea as a wireless operator. He had learned about radio during his teenage years, claiming an ability to "read most any up-to-date scientific book and get most everything in it of value in a few hours." Before becoming a wireless operator, he'd worked a little on farms, but found he hated the sound of steel against the soil, such as the clink of a hoe blade against stone. . . . He even picked a little cotton, but broke out in a severe skin rash, felt ill, and earned only about 20 cents a day at this work. His mother had hoed weeds out of a Texas cotton field as she was carrying her unborn son. Again and again she told herself, "I've got to get out of here!" Maybe by osmosis she passed on to the embryonic Volney her feelings for working in cotton. (He seemed to have believed that himself.) In any case, he left Alabama and the South as a teenager, perhaps never to return. Son of an itinerant farmer and a woman who wanted "to get out of places," Volney Mathison set out for the West Coast sometime between 1910 and 1916. His desire--like theirs--was to wander, "to get out of places." He admitted that he could have done that by railroading, but "the genes of his Viking ancestry said: 'No, to sea!'" Mathison later claimed many years at sea on dozens of ships. (He also implied that he had been to Shanghai and Helsinki among other ports.) He called himself a seaman while registering for the draft in 1918. I have found his name on ships' manifests from 1924-1927. However long he may have been at sea and wherever he may have voyaged, Mathison preferred tramp freighters because they were always leaving one place for another. While in port, he became "idle, moody, and restless." Mathison kept at his seagoing ways through most of the 1920s. Even as late as 1937, he worked as a union representative and spokesman for seamen. More interesting still, in 1938, Mathison applied to the Federal Communications Commission for a radio license for a gambling ship, the "barge" SS Tango, operating out of Long Beach, California. The Tango, recently converted into a luxury casino, was one of two ships owned by Anthony Cornero Stralla (1899-1955), also known as Tony Cornero, Tony Stralla, or just plain Tony the Hat. His ships were designed to float beyond the three-mile limit and thus avoid California's prohibitions against gambling. For a quarter per head, Cornero's passengers were ferried out to the ships, where they might drop all together $300,000 per "cruise." In any case, Volney Mathison's application was denied, but Cornero's ships continued operating into the 1940s, finally to be closed down by Governor Earl Warren. It's a funny and fascinating story. You can read more about it on Wikipedia, better yet on a website called Cruising the Past, here. Incidentally, Cary Grant was in two movies linked to Tony Cornero and his gambling ships: Gambling Ship (1933) and Mr. Lucky (1943). By the time he applied for that radio license, Mathison had worked his way through one career and into another. Both grew out of his work as a radioman, first through his writing, then through his invention of what would later be called the E-meter. The SS Tango, originally Star of Scotland, Tony Cornero's converted gambling ship of the 1930s and '40s. Volney Mathison applied for a radio license for this ship in 1938. The license was denied but the ship kept raking in the cash. Original text and captions copyright 2012 Terence E. Hanley. Quotes from Volney G. Mathison, taken from "Hidden Drives Pick Our Jobs and Professions," from The Aberee, Dec. 1956, are presumably in the public domain. I don't know much at all about the Swedish-American author Genevieve Larsson, but I can write what I know and surmise a little further. Her first story, "Witch Mary," printed in Pictorial Review in January 1923, was a hit and earned her an O. Henry Memorial Award and entry into Prize Stories of 1923. In writing about her story and her life in the magazine The Editor, Genevieve revealed that she had studied short story writing under Dr. Blanche Colton Williams and her assistant, Shirley V. Long, at Columbia University. If you remember from a previous entry, Theda Kenyon (1894-1997) also studied under the good doctor. If Genevieve Larsson wrote her first story in 1922 or thereabouts, then perhaps she was born at about the turn of the century or a little earlier. Concerning myself, I hesitate to speak [she wrote in The Editor]. It is my ambition to write of the people I know, and to whom I belong, the Scandinavians of this country. A deep strain of mysticism, an undercurrent of melancholy, run [sic] through their veins. The American writers who have handled these people have done so from the outside in. I want to do it from the inside out. Whenever an American wants a stupid cook in a story, or a lumberjack, he invents what he considers a Swede by giving the character a Scandinavian name and having him speak in atrocious dialect. We aren't all cooks, we aren't all lumberjacks, nor are we all slow and stupid. Some of us can even speak English. It's strange, perhaps, but it's true. The descendants of the proud Vikings form too vital a part of our American civilization to be disposed of in this fashion. In so writing, Genevieve didn't tell us where she is from, but we can guess it was in the upper Midwest or somewhere else in the northern tier of states. That doesn't narrow it down much, but two newspaper articles place Genevieve in New York in the 1920s and 1930s. Both articles describe her as an author and associated with a crime, in both cases as a possible witness. The first is minor. 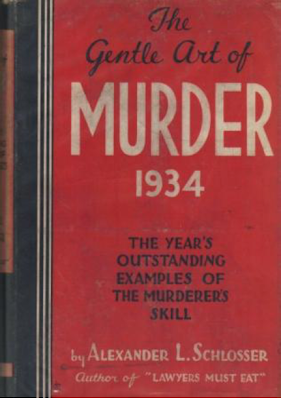 The second involves a notorious missing persons crime, the case of Agnes C. Tufverson, who disappeared in 1934 and is believed to have been murdered and dismembered by her conman husband, the "young and charming" Jugoslavian Ivan Poderjay. Genevieve Larsson wrote stories for Pictorial Review, The Century, Live Stories, and The Delineator. True to her ambition, she wrote about the people she knew in "Ingeborg the Proud" (Pictorial Review, June 1924) and "Astrid and the Hill Folk" (Pictorial Review, Dec. 1924), the latter illustrated by the Swedish-American artist Gustaf Tenggren (1896-1970). Tenggren had arrived in the United States a few short years earlier, in 1920. He went on to create illustrations for children's books and the Walt Disney studio. There are too many really fine images of artwork by Tenggren for me to choose one to display here. Don't hesitate searching for them yourself, though. Genevieve Larsson on the other hand has become an obscure figure. 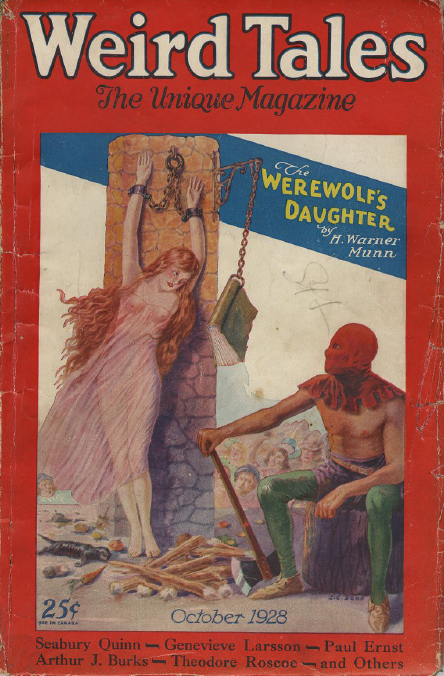 Her lone work for Weird Tales was "The City of Lost Souls," printed in the October 1928 issue of the magazine. That's as much as I know. Having written about Genevieve Larsson (Swedish-American), Signe Toksvig (Danish-American), Charlton Lawrence Edholm (Swedish-American), and Alexander L. Kielland (Norwegian), with Volney G. Mathison (Danish-American) still in progress, I have covered many of the Scandinavian and Scandinavian-American writers for Weird Tales. I'll be on the lookout for more in the future. You can read the full text of "A Unique Philosophy" by Genevieve Larsson online in The Editor, Vol. 59-60. You can also read more about the Tufverson case in Ten Perfect Crimes by Hank Sterling. In your Internet search, look for a new use for vanishing cream. A story by Genevieve Larsson appeared in this issue of Weird Tales, October 1928, with a cover art by C.C. Senf. If you want to read a true weird tale, you might try the story of Agnes Tufverson, a New York lawyer who disappeared in 1934 and was never found. 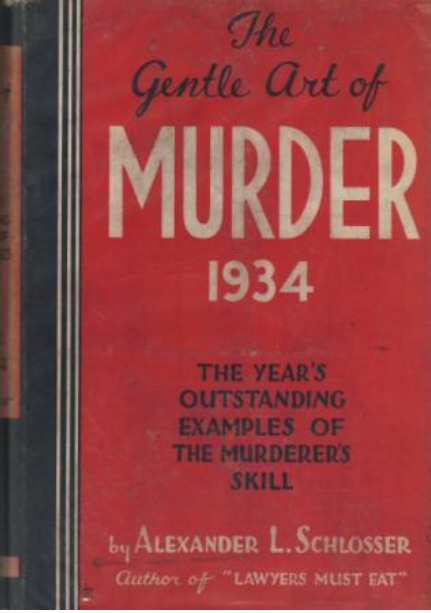 Alexander L. Schlosser recounted the story in The Gentle Art of Murder, 1934. So what's the connection? Genevieve Larsson was friends with Agnes and offered a lead to the police as to her whereabouts. Though considered a Danish author, Signe Toksvig wrote exclusively in English and crisscrossed the Atlantic Ocean several times, living in her native land as well as in the United States and Ireland. Signe Kirstine Toksvig was born on February 14, 1891, in Nykøbing Sjælland, on the island of Zealand in Denmark. She came to the United States with her family in 1905, first to Troy, New York, later to live in New York City. Signe graduated from Cornell University in 1916 and went to work at The New Republic as an assistant editor. In 1918 she married one of the founders of the magazine, Irish-born writer and critic Francis Hackett (1883-1962). The couple made several trips to Ireland and Europe in the early 1920s and lived in Ireland between 1926 and 1937. 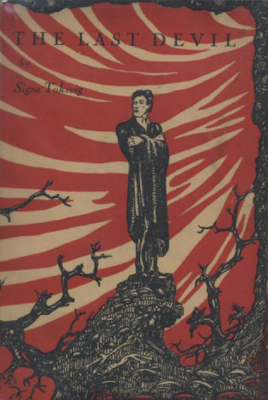 Signe and Hackett left Ireland after the nation banned her novel Eve's Doctor (1937) and his novel The Green Lion (1936). They lived in Denmark 1937-1939 and spent the war years in the United States. The Hacketts returned to Europe in the 1950s and settled at last in Copenhagen in 1952. Their literary friends included Ellen Glasgow, Karen Blixen, Sigrid Undset, and Hendrik van Loon. Signe Toksvig wrote biography in The Life of Hans Christian Andersen (1933) and Emanuel Swedenborg: Scientist and Mystic (1948); and fiction in the novels The Last Devil (1927), Eve's Doctor (1937), Port of Refuge (1938), and Life Boat (1941). Her other books included Fairy Tales and Stories (1921), adapted or translated from Hans Christian Andersen's work; Signe Toksvig's Irish Diaries, 1926-1937 (1994), edited by Lis Pihl; and Free Lances (ca. 1976), an unpublished autobiography now in the collections of Cornell University. Signe published stories in The Popular Magazine in 1925-1926 and Tomorrow in 1942-1943. 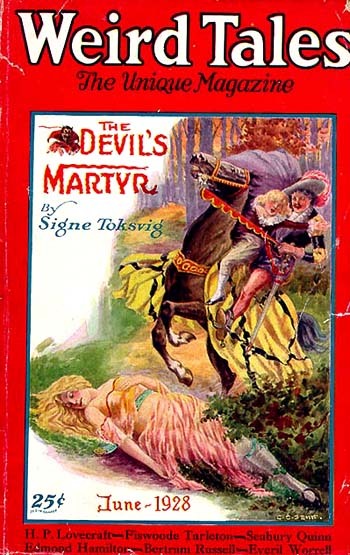 Her lone work for Weird Tales was "The Devil's Martyr," the cover story of the June 1928 issue. Incidentally, I believe Signe Toksvig's brother, Harald Toksvig, was the same Harald Toksvig who worked as an artist, illustrator, translator, and editor. A Harald Toksvig was responsible for: 1) translations of stories by Gustav Wied published in Our World in 1924; 2) the original map of Sherwood Anderson's fictional Winesburg, Ohio; and 3) scripts for Danish-language Mickey Mouse comic book stories. If those were all the same author, I should say he was a versatile man. The author Signe Toksvig died on January 15, 1983, in Kongens Lyngby, near Copenhagen, Denmark, at age ninety-one. Cornell University holds Signe Toksvig's papers. There are lots of materials on her online as well. The cover of Signe Toksvig's 1927 novel The Last Devil. And the cover of Weird Tales for June 1928 featuring the similarly entitled story "The Devil's Martyr." The cover art is by C.C. Senf. 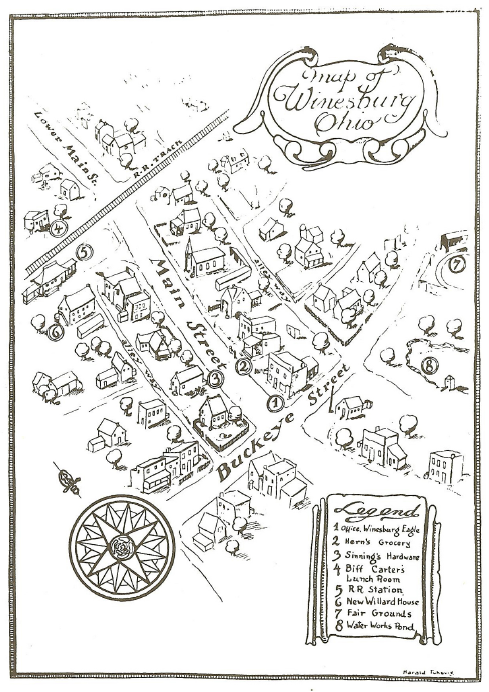 Winesburg, Ohio, a fictional town and subject of Sherwood Anderson's novel of the same name. The cartographer was Harald Toksvig, who I believe was the brother of Signe Toksvig. 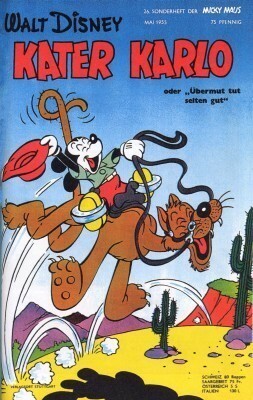 A German-language Mickey Mouse comic book with story or stories by a Harald Toksvig. Was he the same Harald Toksvig? I hope a German or Danish reader can answer that question. P.S. Thanks to Louisa, a Swedish reader, for a correction to the captions. 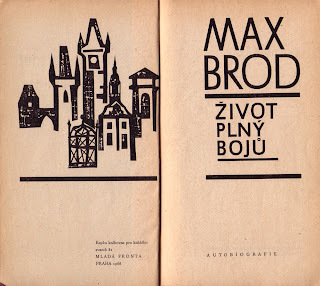 Max Brod was born on May 27, 1884, in Prague, then a city in Austria-Hungary, now capital of the Czech Republic. Though an accomplished author in his own right, Brod is most well known as the executor of Franz Kafka's literary estate and the man who did an inestimable service to world culture by saving Kafka's papers from the incinerator. Kafka (1883-1924), Brod's friend and an author himself of more than one weird tale, had stipulated that Brod burn his papers upon his death. Instead Brod preserved them, and--in 1939, as the Nazis completed their takeover of Prague--spirited them away to Palestine. Those papers have been subject of a recent lawsuit over their ownership. Kafka may have made something of that. A fervent Zionist, Brod remained in Palestine and--after 1948--the state of Israel until his death in Tel Aviv on December 20, 1968, a decisive year in the history of his country. His one story for Weird Tales was "Death Is a Temporary Indisposition," translated by the American linguist and teacher, Roy Temple House. The story appeared in the April 1938 issue of the magazine, the same month in which Hitler made his initial demands on Czechoslovakia, demands that would culminate in appeasement, annexation, and finally war. Ernst Wurm was an Austrian author and artist, born in Katzeldorf on June 30, 1906. Wurm worked for the ORF (Austrian Radio Broadcast) in 1933. His story "Gica Lacilu, the Magician" was printed in Weird Tales in August 1937, only a few months before the Anschluss. Wurm died on September 30, 1971, in his homeland. I'm afraid I know nothing more about him. 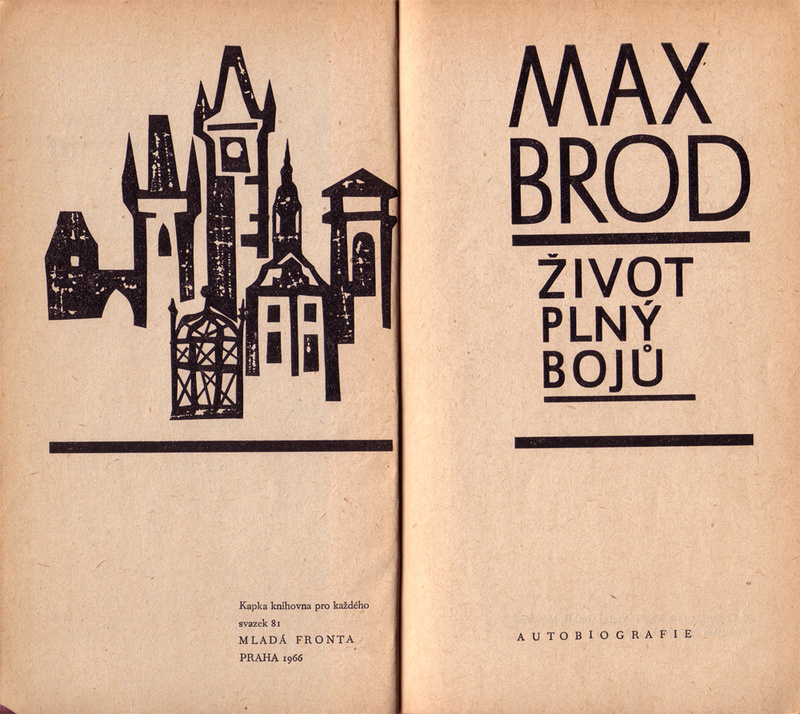 The title page of Max Brod’s Život Plný Boju designed by Jaroslav Šváb in 1966. Charlton Lawrence Edholm was a versatile artist and a writer of poetry, fiction, and non-fiction. Born on March 21, 1879, in Omaha, Nebraska, Edholm was the son of a pair of writers and lecturers. He traveled widely and lived at one time or another in Los Angeles, Arizona, Washington, D.C., The Bronx, and Dobbs Ferry, New York. Edholm studied art in Stuttgart and Munich under Ludwig Herterich (1856-1932), a painter and teacher of the Munich School. (Herterich's pupils also included Käthe Kollwitz.) In addition to being a painter in the style of the French Impressionists, Edholm worked in pastel, created illustrations for various magazines, held one-man shows, and exhibited his work at the Whitney Gallery in New York. During World War I, Edholm wrote for the Inter-Racial Council in Washington, D.C. He was also the editor of the magazines Live Stories and Out West. His list of publishing credits is very long and includes everything from the New York Times and the Los Angeles Times to The Saturday Evening Post, The Smart Set, and Ladies Home Journal to Top-Notch and Sweetheart Stories. Edholm wrote science fiction and fantasy for Astounding Stories ("Ping Ting," October 1933) and Weird Tales ("The Man Who Was Damned," June 1927, and "The Rose Window," August 1928). He was also published in the hero pulp The Phantom Detective. In addition to writing poems for many magazines, Edholm authored articles, short stories, serials, and novels. Charlton Lawrence Edholm came from a family of writers, and he lived with a family of writers. His mother, Mary Gow Charlton Edholm (1854-? ), was a reformer and lecturer and wrote for the Phrenological Journal, Christian Reformer, and other journals. His Swedish-born father, Osborn Edholm, was a journalist. Charlton Edholm's wife, Lizette MacCully Edholm (1878-1967), wrote four books in the Merriweather Girls series, all published in the year 1932. The Edholms' daughter, Mayzette Golan, was also an author of children's books. Unfortunately I haven't found any of her works yet. Charlton L. Edholm settled in Dobbs Ferry, New York, and took part in the cultural life of that small town on the Hudson River. Edholm died in Dobbs Ferry on September 13, 1945 (not September 14 as has been reported elsewhere on the Internet). He was sixty-six years old. 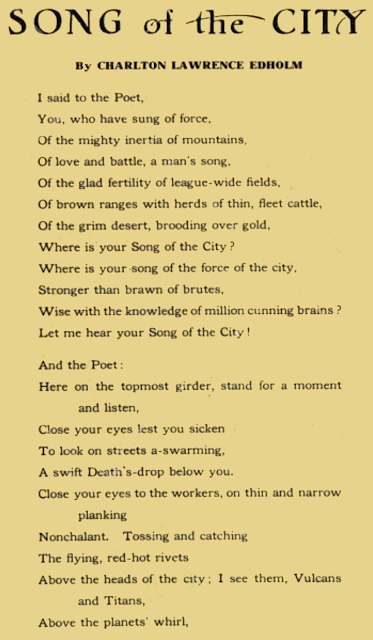 Much of Charlton Edholm's verse and some of his prose is available on the Internet. As bygone loves sleep in the true love's breast. For you, my Sonnet, chaste, serene, and strong. A poem by Edholm from 1908. 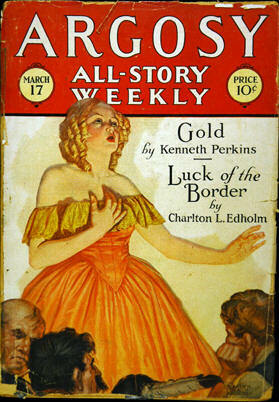 The cover of Argosy All-Story Weekly for March 17, 1928, with Charlton Lawrence Edholm's byline on the cover. Edholm's wife, Lizette Edholm, was also an author. Here is a reproduction of the dust jacket for one of her four Merriweather Girls novels from 1932. Lizette also wrote a book called Ship Ahoy! published in 1934. Founded in 1894 by the twenty-eight members of the Fairhope Industrial Association, Fairhope, Alabama, was to be a community where Henry George's economic theories could be put into practice. The legend is that the community had a "fair hope" of success, and by most measures, it seems like that has been the case. 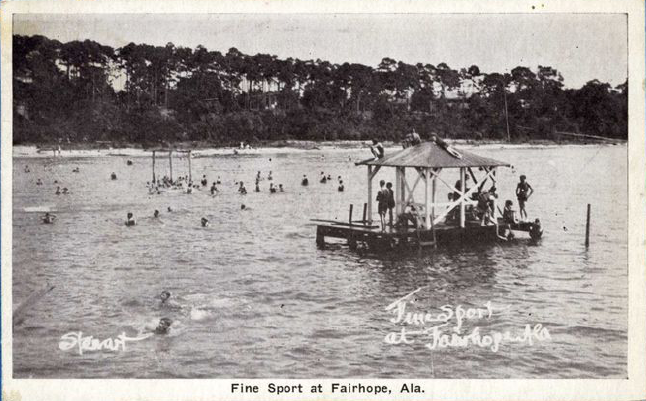 In 1908, the city of Fairhope was established within the bounds of the community. Since then, Fairhope has been a gathering place for artists, writers, educators, and other intellectuals. It has also been a resort and a place for tourists. Among the many people drawn to Fairhope over the years were the family of Volney G. Mathison. Known as one of San Francisco's original Seven Hills, Telegraph Hill has been a burial ground for seamen, the location of a nineteenth-century semaphore, a destination for bohemian intellectuals, and a home for people and parrots. The hill is now topped by Pioneer Park and its Coit Tower, which offers a panoramic view of the city. Below the park, where Telegraph Hill Boulevard meets Lombard Street, you'll find a monument to Guglielmo Marconi (1874-1937), the father of long-distance radio transmission, also known as wireless telegraphy. South and east of Telegraph Hill, at 428 Market Street, is the former location of the Haller and Cunningham Electric Company, a manufacturer and retailer of wireless radio equipment and in operation between 1911 and 1920. In 1918, less than a month after he turned twenty-one, Volney Mathison registered for the draft in California, giving his address as 428 Market Street and his employer as Haller Electric Company. When asked his occupation, Mathison answered "Seaman." In all likelihood, he was actually the operator of a shipboard wireless telegraph or radio, the same job that would occupy him for at least the next decade. Only twenty years before, Marconi had ushered in the era of radio communications with a series of tests and trials in Europe and the United States. On May 13, 1897, for example--only three months before Volney Mathison was born--the first ever wireless telegraph message was sent over the open seas. The distance for wireless transmissions became greater with each successive test. By 1903, even the Atlantic Ocean no longer presented a barrier to wireless messages. "Marconi's activity aroused world interest," observed The Pictorial History of Radio. "The result was that the first application for radio was established for marine telegraphy." In 1912, a young David Sarnoff made a name for himself when he received messages from the Carpathia, a ship carrying passengers rescued from the wreck of the Titanic. Somewhere out on the continent, in Alabama or Oregon or California, a teenaged Volney Mathison may very well have taken notice. He must have remembered his father's words to "read up-to-date scientific books." In any case, Mathison became a licensed wireless operator at age sixteen, only a year or two after the Titanic disaster. Like countless hobbyists all over the country, Mathison must have built his own radio sets to listen in on radio traffic and to communicate with other operators. It must have been exciting to participate in the development of a new technology and a new medium. I have offered these details on the history of radio because knowing something about radio is important in understanding Mathison's life and work, and for two intertwined reasons. First, Volney Matthison the inventor is known for a piece of electrical equipment called the E-meter, derived from his work as a radioman and used by followers of L. Ron Hubbard from the 1950s onward. Second, Volney Matthison the author is known for writing in a new genre of literature advanced by a radio entrepreneur, a man named Hugo Gernsback, sometimes called the father of science fiction. (1) I haven't found Fred Mathison in the 1910 census, but he reappeared in 1920 in Alameda, California, working as a farm laborer. In 1930, he was enumerated with his sister and brother-in-law in Oakland, California. Volney Mathison registered for the draft in California in 1918, giving his father's name as his nearest relative. In 1931, Volney gave a Berkeley address in a passenger list. I don't know when Fred Mathison died, but for a dozen years or more towards the end of his life, his son was close at hand. 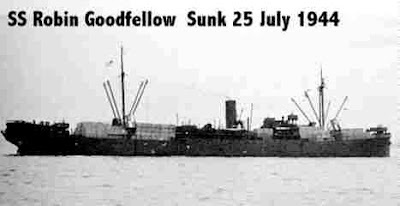 (2) For those keeping track: The SS Robin Goodfellow, a steam cargo ship built in Seattle in 1920, was torpedoed by a German U-boat on July 25, 1944, in the South Atlantic. The SS Greylock, also a steam cargo ship but built in Los Angeles in 1921, was torpedoed by a U-boat on February 3, 1943, northeast of Iceland. (3) Like Henry George before him, Volney Matthison went to sea as a teenager. The two men also lived in San Francisco for some time during their lives, and of course both were writers. I would not say that Matthison was trying to imitate George, but it's my business here to make connections. A postcard from Fairhope, Alabama, from the 1920s, long after Volney Mathison had departed. 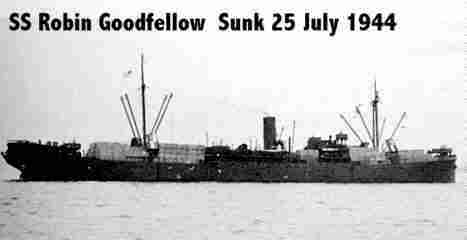 The SS Robin Goodfellow, a poor reproduction of an image showing just one of the ships on which Mathison served during the 1920s. The SS Greylock, another cargo ship, built on the West Coast and in service in the Pacific Northwest during the 1920s. Volney Mathison served on board these two ships as a radio operator. He may not have been an employee of the shipping company, rather one of a radio or wireless company. If anyone who knows about early shipboard radio operations, feel free to write. 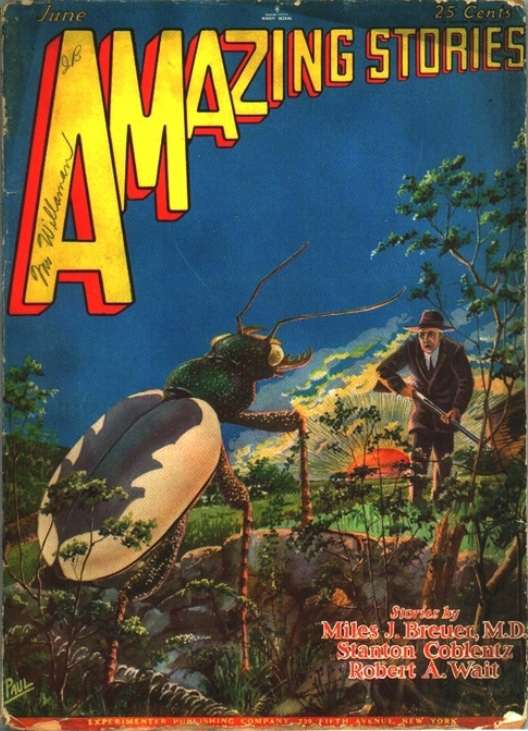 When I started this blog, I set out to show that pulp magazines and their authors did not exist on an island, that they were in fact part of the larger world of history and culture. Volney G. Mathison is a case in point, for his life was shaped by historical events large and small, everything from the theorizing of a now obscure nineteenth century economist to the early twentieth-century enthusiasm for radio to mid-century religion sprung from science fiction. The putative facts on his life are curious and in some places contradictory. What you read about him on the Internet may be inaccurate, misinformed, or even maliciously fabricated. I may not have the whole story, but I think I can lay down a foundation for his biography. L. Ron Hubbard will rear his head as he has in previous blog entries. This time it will be by design and in relationship with an associate who contributed to Weird Tales magazine, the author and inventor Volney G. Mathison, also known as Dex Volney. The story of Volney G. Mathison begins with his immigrant parents, their peregrinations, and their efforts at eking out a living in a new world. Described by his son as "a restless, intellectual, itinerant laborer of Norse descent," Fred Mathison was born in Denmark in October 1859 and came to the United States in the 1870s. By the time he showed up in the public record--in 1900--he was married and living in the Pacific Northwest, employed as a day laborer. (1) With him were his young wife, Agnes Mathison, and their two-year-old boy named Volney. Agnes Mathison (maiden name unknown) was born in Germany in October 1877 and immigrated in the 1880s. According to Volney Mathison's later account, his mother was only sixteen when he was born. (If the 1900 census is correct, she would have been nineteen instead.) He claimed that she was from "a once-wealthy German family that had been wiped out in some Prussian war." If that's so, she had fallen far by the time her son came into the world on what he called "a poverty-stricken cotton ranch in Texas." Officially, Volney G. Mathison was born on August 13, 1897, in Paducah, Texas, a small north-Texas town, later home of the original Marlboro Man. They lived in a dugout [Volney wrote of his family]--a hole in the ground with a sod roof over it. The mother, while carrying her baby, hoed cotton all day long, barefooted under the blazing sun. The total proceeds for this back-breaking labor for a whole year, as she computed it in advance, would be only about $65. So, as she hoed, she said frantically, savagely to herself: "I've got to get out of here! I'll DIE if I don't get out of here!" When the baby was born [he continued], the little 96-pound mother had but scanty clothing for the infant, the sod hut was draughty, and during a January "blue norther," the temperature dropped so low the baby nearly froze to death. Soon after her son was born, Agnes Mathison escaped the hoe and the hole to the Pacific Northwest. Nineteen hundred and the Federal census found the Mathison family in Coos County, Oregon. Volney Mathison, having survived the north-Texas winter, was then two years old. His younger sister, Eva G. Mathison, was born a couple of years later in Oregon. Eight years after that, the three of them--Agnes (then calling herself "Bertha A. Mathison"), Volney, and Eva--were living in a small town in Alabama. In a search of the 1910 census, however, Fred Mathison, comes up missing. So what carried the Mathison family from Oregon to Alabama? And what happened to Fred Mathison? Volney Mathison's account of his parents' life on that Texas ranch offers a lead. Mathison's account--apparently written without any sense of irony--is a revealing one. It not only leads to the likely reason for the Mathison family's relocation to Alabama, it also implies that Mathison identified with his father through his embrace of his father's beliefs. Moreover, Mathison expressed admiration for beliefs that--for better or worse--now exist only along the fringes of economic thought. His tone suggests the voice of a crank. Whether that voice was his father's or his own is open to interpretation. In any case, Mathison lets us know that his father's words were repeated not just to his mother. Young Volney must have heard them again and again throughout his childhood. "One must be wary about believing things people declare are 'eternal truths'. One must always investigate and find out the facts." Volney Mathison wrote those words for the December 1956 issue of a newsletter called The Aberee, published by an organization--headed by L. Ron Hubbard--that had recently changed over from a mere belief in Dianetics to the formation of the Church of Scientology, an organization that laid claim to truth while playing fast and loose with the facts. Volney Mathison's long quote is also revealing for its mention of the American economist and politician Henry George (1839-1897) (2). George, who died just two months after Mathison was born (3), promulgated his ideas on taxes and economics in Progress and Poverty (1879) and other books. His ideas gave rise to Georgism, one of countless economic, social, and political philosophies of the nineteenth century. I won't go into detail on George's ideas. Suffice it to say that despite the admiration of figures as diverse as Ralph Nader and William F. Buckley, Jr., Henry George's philosophy has gained little traction in the world, except, by coincidence, in Fred Mathison's native Denmark, and by no coincidence at all in the Utopian community of Fairhope, Alabama, the place where Fred Mathison's family was enumerated in the 1910 census. (1) Fred Mathison may have lived in the Pacific Northwest or on the West Coast as a child or a young man, but I haven't been able to match him up with anyone in the Federal, state, or territorial censuses. (2) Curiously, George was the grandfather of dancer and choreographer Agnes de Mille and actress Peggy George. His son-in-law and his son-in-law's brother--William C. de Mille and Cecil B. de Mille respectively--were movie producers. In one way or another George was also the progenitor of the board game Monopoly. You don't have to take my word for it. You could look it up. Update (June 17, 2013): I have begun reading Going Clear: Scientology, Hollywood, and the Prison of Belief by Lawrence Wright and have found that Cecil B. de Mille's adopted son (and biological son of Cecil's brother, William C. de Mille), Richard de Mille, was an assistant to L. Ron Hubbard. The two men parted early in the history of Dianetics. Richard de Mille went on to become a psychologist, teacher, and writer. (3) I haven't yet found Volney Mathison's middle name, but could the middle initial have stood for "George"? And what about his sister Eva's identical middle initial? According to his granddaughter, dancer and choreographer Agnes DeMille, Henry George was in his time one of the three most famous men in America (along with Mark Twain and Thomas Edison). 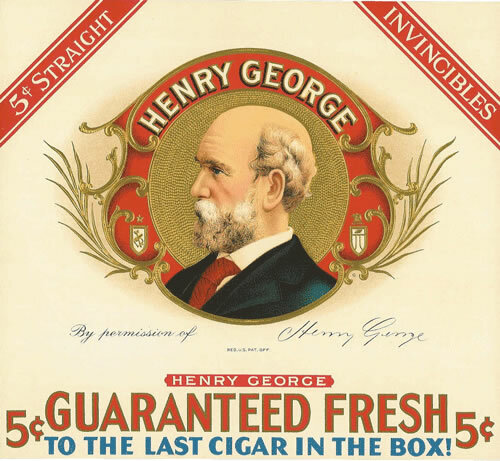 Today he is almost unknown, but in the 19th century, you could even buy a Henry George brand cigar, and for only a nickel. Thomas Marshall would have been pleased. George had followers all over the world, including Leo Tolstoy and George Bernard Shaw. In America, he could have counted Fred Mathison in that group. Mathison, a Danish immigrant and hardscrabble farmer, was the father of Volney G. Mathison, radioman, inventor, and teller of weird tales.